Seizure disorders occur when the electrical activity in the brain goes haywire for a short period of time. Electrical signals pass between nerves and the brain to control such functions as respiration, movement, and sight. An abnormal electrical impulse or an interruption in an impulse can result in a seizure. Chronic seizures are often referred to as epilepsy. It should be noted that a child may have the word ‘seizure’ listed in their pre-adoptive medical report, without necessarily having the chronic form of seizures called epilepsy. A single or small number of seizures may result from an illness, high fever, head injury, or defect in the nervous system. Seizures can present with different symptoms ranging from uncontrollable movements to a simple temporary inattentiveness. A major seizure will cause a loss of consciousness and a loss of bladder control. 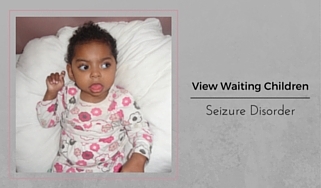 Pre-adoptive parents should request further medical information on a child listed as having seizures. Doctors can prescribe medication for recurrent seizures. These anti-seizure medications can suppress the aberrant electrical impulses in the brain. Surgery is a drastic option for children who do not respond to medication. If a seizure lasts longer than five minutes of if you notice any difficulty in breathing, get immediate medical attention. A physician should evaluate any child who has a seizure. Never try to restrain a child who is having a seizure. Children with seizure disorders can attend school and lead regular lives.